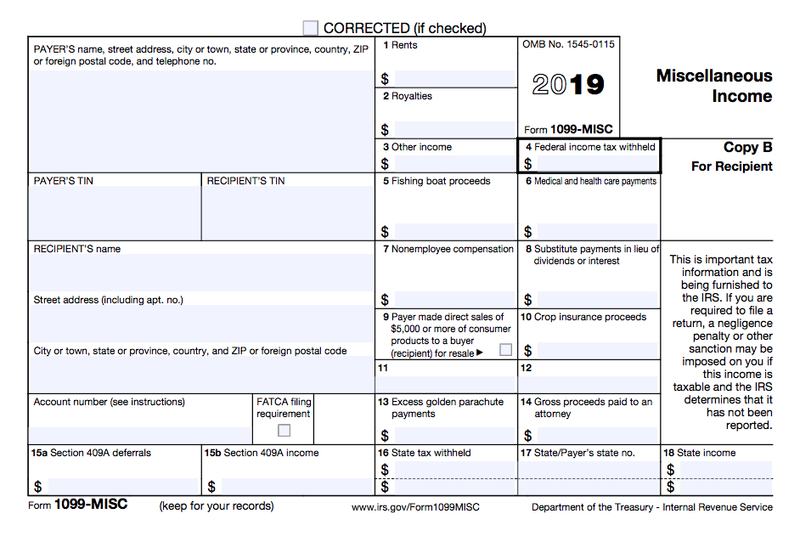 What Is a 1099 Form, and How Do I File One? What if you don’t receive a 1099 from a business? What happens if you miss the 1099 filing deadline? If you’re getting started as a freelancer or your small business is contracting outside help, you’ve probably heard of IRS Form 1099. But what is it, exactly? And how do you file it? A 1099 is an “information filing form”, used to report non-salary income to the IRS for tax purposes. There are 20 variants of 1099s, but the most popular is the 1099-MISC. If you paid an independent contractor more than $600 in a financial year, you’ll need to complete a 1099-MISC. An individual can also earn income from tax dividends, prize winnings, the sale of personal property, or other methods. These earnings are reported on other types of Form 1099, which you can read all about here. If you’re a small business owner, you’ll most often be dealing with Form 1099-MISC, so we’ll focus on that one. If you’re an independent contractor, it’s not your job to file the 1099-MISC. But if you don’t receive a copy of the 1099-MISC from your client, you should follow up with them. An independent contractor is anyone you hire on a contract basis to complete a particular project or assignment. By definition, an independent contractor is not an employee. Common examples include graphic designers, web developers, copywriters, and social media consultants. If you hire a freelancer through a third-party service, you may not be required to submit a 1099 for them. For instance, if you hire a freelancer through Upwork, Upwork is actually the one doing the hiring, so you don’t need to submit a 1099. These details vary from one third-party hiring service to another. Check out the company’s “About” or “FAQ” section for tax filing details before you start using their service. This will depend on whether you hired any independent contractors this year, and how much you paid them. If you paid an independent contractor less than $600 over the course of the financial year, you don’t need to submit Form 1099-MISC for them. Keep in mind that if you’re an independent contractor, you still need to report all your income. Even if you did less than $600 of work for a client and never received a 1099. If you did pay a contractor more than $600 for services, rent, or for any other type of miscellaneous income payment, you need to file a 1099. But there are exceptions to this rule. It’s rare, but sometimes an independent contractor will be registered as a C corporation or S corporation. You don’t need to file Form 1099 for a contractor registered as a corporation. The IRS makes strict distinctions between employees and independent contractors. And they’re often on the lookout for business owners who misclassify workers. You’ll need to file a Form W-2 to report wages, tips, and other compensation you paid to an employee during the tax year. There are significant penalties for misclassifying employees as independent contractors. Make sure you know how to tell the difference between an independent contractor and an employee before you submit a 1099. Let’s say you own a mini-golf course, and it needs some touching up. You hire a local landscaper to come in and beautify the area around the eighteenth hole. The landscaper works solo, operating as a sole proprietorship. He comes in and plants eighteen miniature palm trees. It looks fantastic, and only costs $3,000. During tax season, it’s up to you to send him a Form 1099-MISC, recording the amount you paid him, and the service you’re paying him for. You’ll also send a copy to the IRS. Now let’s say a winter storm blows in and kills off all the palm trees. You realize, based on the local climate, tropical plants may not be a suitable decoration. You decide that you want giant replica Easter Island heads by the eighteenth hole instead. You call your landscaper from before, but he tells you he doesn’t do Easter Island heads—you’ll have to talk to someone with a bigger operation. You get in touch with Global Stonework Megacorp Inc., and they’re only too happy to install the heads. The charge is $6,000 (a little pricier than palm trees, but this is a long-term investment). You don’t have to worry about sending a 1099 to Global Stonework Megacorp Inc., because they’re a corporation, not an independent contractor. Suppose you’re a freelance graphic designer, and a local coffee shop called Whole Latte Love pays you $1,000 to design their new logo. You do the work, and they love it. 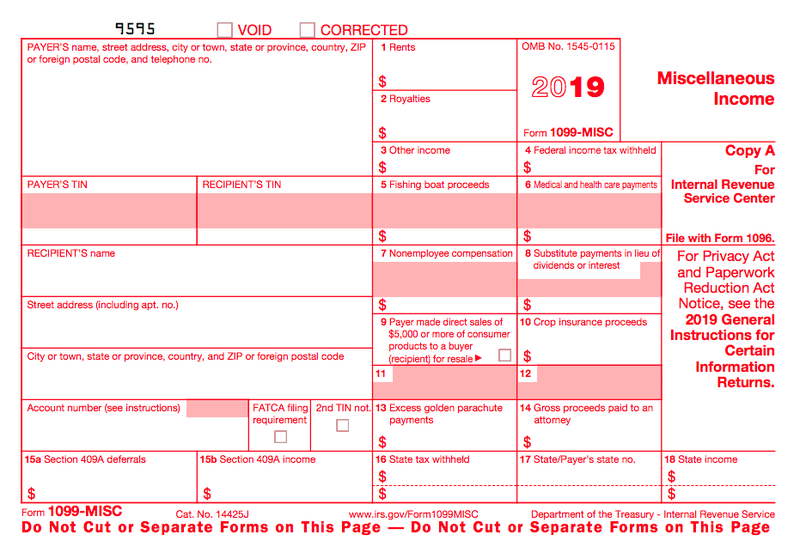 Come tax season, they send you a Form 1099-MISC, just like they’re supposed to. Now suppose you don’t hear from Whole Latte Love for a couple years. They eventually come back and want a light design refresh of their logo—"something more minimalist”. You get the changes made in one day, they love it, and you bill them for $450. In this case, they would not send you a 1099-MISC because you didn’t do $600 of work for them. There are two copies of Form 1099: Copy A and Copy B. If you hire an independent contractor, you must report what you pay them on Copy A, and submit it to the IRS. You must report the same information on Copy B, and send it to the contractor. If you’re an independent contractor and you receive a Form 1099, Copy B from a client, you do not need to send it to the IRS. You report the income listed on Copy B on your personal income tax return. The standard method for acquiring this information is to have each contractor fill out a Form W-9. As a best practice, you should have a W-9 on file for each of your independent contractors. Having contractors fill out a W-9 should be one of the first administrative tasks you complete after engaging their services. Check your bookkeeping records to confirm the total amounts you paid to each contractor during the tax year. Once you have all of the required information, use it to fill out Form 1099-MISC. Copy A of Form 1099-MISC must be submitted to the IRS by January 31, 2019, regardless of whether you file electronically or by mail. When you file a physical Form 1099-MISC, you cannot download and submit a printed version of Copy A from the IRS website. Instead, you must obtain a physical Form 1099-MISC, fill out Copy A, and mail it to the IRS. Learn how to get physical copies of Form 1099-MISC and other IRS publications for free. Once your Form 1099-MISC is complete, send Copy B to all of your independent contractors no later than January 31, 2019. You can download and print a version of Copy B from the IRS website and send it to your independent contractor. This process is explained in further detail on the first page of Form 1099-MISC. If you file a physical copy of Form 1099-MISC, Copy A to the IRS, you also need to complete and file Form 1096. The deadline for Form 1096 is January 31, 2019. Depending on where your business is based, you may also have to file 1099 forms with the state. Check in with your CPA and ensure you’re compliant with your state’s 1099 filing requirements. You can e-file Copy A of Form 1099-MISC through the IRS Filing a Return Electronically (FIRE) system. This form must be produced with the help of compatible accounting software. Before using FIRE, you need a Transmitter Control Code (TCC). You can request a TCC by filling out Form 4419 and then mailing or faxing it to the IRS. This form must be submitted at least 30 days before the tax deadline for your Form 1099-MISC. Once the IRS contacts you with your TCC, you may use it to create an account with FIRE. You can email Copy B to your contractor, but first you need their consent to do so. Consent should be obtained in a way that proves the contractor can receive the form electronically. If you’re planning to email them a copy, you should contact them via email to obtain consent. Affirmation of the fact that, if the recipient does not consent to receiving an electronic copy, they will receive a paper one. The scope and duration of their consent. For instance, are they agreeing to receive an electronic copy this year, or every year they work for you? How to request a paper copy from you, even if they have given consent to receive an electronic one. Instructions on how to withdraw consent. They may withdraw consent at any time in writing, electronically or on paper. You must also confirm their withdrawal in writing. Under what conditions the statement may no longer be provided—for example, if the contractor’s contract is cancelled, or if you end up paying them less than $600 for their services. The procedure they need to follow to update their information with you. A description of the hardware and software they need to view and print the form. A date at which the form will not be available. For example, if you are making it available to download via your company’s website, you must tell them at what point in time the form will be removed from your servers. Once you’ve received consent from the contractor, you are free to send them their Copy B electronically. The deadline to file Copy A with the IRS is January 31, 2019, if you’re reporting payments in box 7. Otherwise, the deadline is February 28, 2019 if you file on paper, and April 1, 2019 if you file electronically. The deadline for sending Copy B of Form 1099 to your contractors is January 31, 2019. The due date is extended to February 15, 2019 if you’re reporting payments in box 8 or 14 of 1099-MISC. If you’re a contractor, it’s your client’s responsibility to send you a completed copy of the Form 1099-MISC by January 31, 2019. If you haven’t received Copy B of a 1099 from your client by the deadline, and you believe you should have, make sure you request it. You will need it to file your income taxes in April. Regardless of whether you receive a Form 1099-MISC, you must report all income earned on your tax return. The amount of the penalty is based on when you file the correct information return. If you aren’t able to file on time, you can request an extension using IRS Form 8809. But this does not extend the January 31, 2018 deadline for submitting a copy of the 1099 to independent contractors. Filing 1099s yourself is inexpensive, but it’s also difficult and time-consuming. It’s common for online payroll software providers to offer a filing service and submit 1099s on your behalf. There are plenty of options to consider, but two that we’re happy to recommend are Gusto and JustWorks. Gusto’s system supports independent contractor and employee payments, and there’s no extra cost to generate a 1099 form at the end of the year. Gusto will automatically create and send a Form 1099-MISC electronically to each of your contractors. They’ll also e-file a copy of each 1099 with your tax documents. Provided that you pay your contractors via the Justworks platform, Justworks will mail a Form 1099-MISC to each contractor at the end of the year. Justworks will also file an electronic copy of the 1099 to the IRS on your behalf. This service is available for free with all Justworks packages. Certain CPAs or tax accountants will collect all of the necessary information on your behalf, and ensure that 1099 forms are filed on time. If you’re not working with one, learn more about how to find, hire and work with an accountant. Keep in mind that most will charge an additional fee for this service.